Successfully Added 2.8 Inch Screen MP4 Player 2GB - Camera + NES Emulator to your Shopping Cart. MP4 Player with incredible features and functions including a huge 2.8 Inch TFT Screen, a 1.3 CMOS camera and camcorder and an NES Emulator for hours of game playing fun. Control for the PMP is easy for both navigation and perfect for gaming with a 4 way D-Pad and 4 button control along with a cool looking sliding screen to cover the controls when the PMP is not in use. Other exciting and excellent features include the built in tools such as an E-Book reader, calculator, and English to Chinese dictionary, two built in background themes with the option to use any photograph as the background as well, great 320x240 30fps digital movie playing, picture and movie effects, SD Card slot for adding 2GB more memory anytime, and AV OUT. 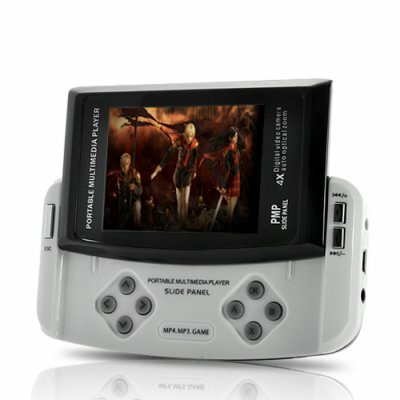 A very cool looking MP4 player, camera, and game platform mix available at Chinavasion's low wholesale price. I bought one for my son for his birthday. He loves it. Now is older sister wants one. When he gets bored playing games he likes to take photos. Picture quality isn't that bad considering the price. good morning i think this item is verry good but i have sum questions like does it have the right for importing in italy the C.E.? I just happend to see this item and it is really marvellous for its price, in india it was purchased for Rs.6500 by my friend. Really the piece is excellent and I envy the owner of it. I shall own one very shortly.